What do you usually do when an important text comes in but you’re walking around drinking your expensive gourmet coffee drink? Set the drink down? Try to balance it between your arm and your torso to free up both hands for typing? An invention that is either totally brilliant or completely insane will make it simple to text with both hands, even when you’re carrying a steaming cup of $8.00 latte. 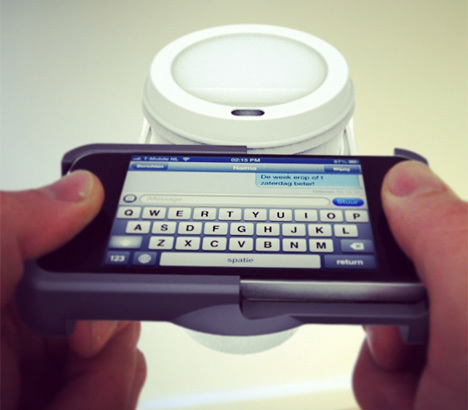 The UpperCup is the world’s first drink carrier iPhone case. It features a pop-out circular holder for your beverage that looks a lot like the cup holders found in a car. 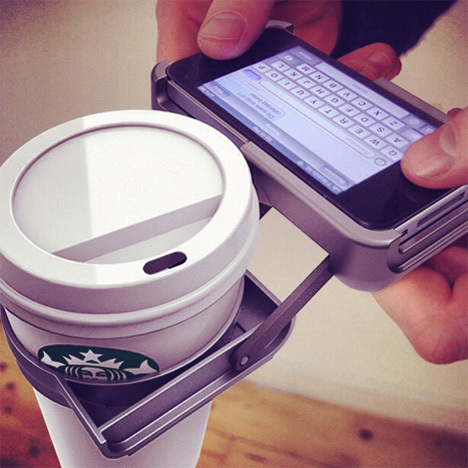 When you need it, it extends away from the case to safely hold your cup while you text. When you’re done with it, it folds flat against your phone. Provided you are smart enough not to try drinking and texting at the same time, the UpperCup could be the cleverest iPhone case ever. Natwerk, the company behind the invention, is currently raising funds on IndieGoGo for a production run. A $25 or $30 contribution gets you one of the world’s first UpperCup cases, plus the satisfaction of knowing you’re a trendsetter. See more in Phones & Mobile or under Gadgets. February, 2013.